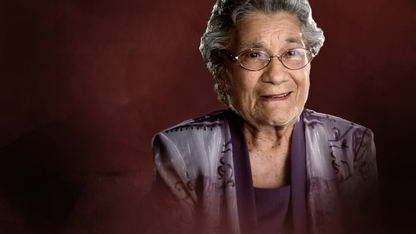 Beaulah Shavney was a proud Chickasaw woman and an original member of the Women’s Army Corps during World War II. The Army originally rejected her several times because she was under the minimum weight requirement. However, the driven Chickasaw woman went on to successfully complete the demanding six-week basic training program and significantly exceeded the Army’s expectations. Shavney served in the Women’s Army from 1943 to 1945 and attained the rank of Tech 4 — a position comparable to the ranking of a sergeant. Shavney graduated from Chilocco Indian School and worked at a hospital in Phoenix, Arizona, before enlisting in the military. The World War II veteran is illustrated in Chickasaw artist Mike Larsen’s famous painting, “She Served Her Country.” That piece of art is currently on display at the Gaylord Pickens Museum. Shavney was also honored by the Ardmore Chapter National Society Daughters of the American Revolution at their Native American Heritage Month celebration. Beaulah passed away on February 22, 2014 at the age of 91.